Nipsey Hussle, Grammy-Nominated Rapper And Philanthropist, Shot And Killed Los Angeles Mayor Eric Garcetti announced the news on Twitter Sunday night. Nipsey Hussle was shot and killed on Sunday in Los Angeles. Grammy-nominated rap artist, entrepreneur and community philanthropist Ermias Asghedom, better known as Nipsey Hussle, was shot and killed Sunday. His death was announced on Twitter by Los Angeles Mayor Eric Garcetti. Nipsey Hussle was 33. The Los Angeles County Medical Examiner-Coroner's office confirmed Monday that he died of gunshot wounds of the head and torso. The shooting took place in South Los Angeles, outside The Marathon Clothing, a store he owned on West Slauson Avenue. Nipsey Hussle was widely respected in the hip-hop world, not just for his musical contributions but for the hustle ethic personified in his chosen stage name. He overcame the obstacles of an unforgiving environment, made famous by generations of West Coast rap legends, to become one of the most beloved and inspirational figures within the culture. Raised in the gangland territory of South Central L.A., Nipsey Hussle came of age as a member of the Rollin 60s, local slang for both a neighborhood and the notorious Crips gang which operates there. Yet he rose to prominence by legitimizing his street hustle and using that entrepreneurial drive to create economic empowerment in his marginalized community. Forbes recently documented his rise as a real estate mogul, which included buying the strip mall on West Slauson Avenue where his Marathon store is located. The purchase was a notable move to positively reinvest in his neighborhood and buy back the block where he'd hustled illegally as a youngster. As an artist, Nipsey Hussle was a noted trendsetter. He was born of Eritrean descent on his father's side, and his hip-hop dreams began in childhood. He released his first mixtape, Slauson Boy Volume 1, in 2005. But real renown began when he employed a marketing move that put the stagnating music industry on notice. After his first label deal, with Epic Records, went sour in 2010, he independently released his 2013 mixtape, Crenshaw, with an unprecedented price point. "The marketing for the mixtape was that we only made a thousand units and sold them for a hundred dollars apiece," Nipsey Hussle told GQ in February in a story about his relationship with his longtime girlfriend, actress Lauren London. "It was a scarcity model." And it worked. At a time when many artists were being told by the industry to give their music away for free, Nipsey Hussle went the other way. Jay-Z, one of many fans he won over with his music and marketing savvy, bought 100 copies. It became the model for his career as a self-starter. When he returned to a major label, it would be in partnership with his independent label, All Money In. His 2018 album, Victory Lap, earned him a Grammy nomination for best rap album. 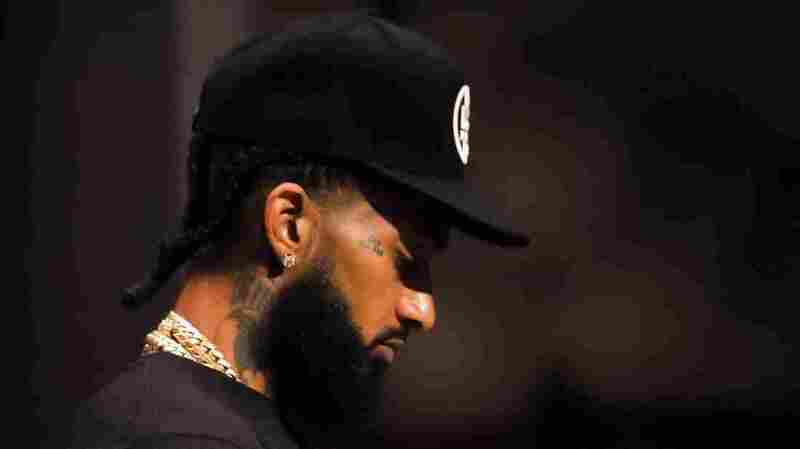 The release — which featured artists including Puff Daddy, YG, Kendrick Lamar and Marsha Ambrosius — was his official major-label debut and a full circle moment for Nipsey Hussle. "Having strong enemies is a blessing," reads Nipsey Hussle's last message on Twitter, posted shortly before his death. But it was through his music — filled with stories about gang life, of rising above struggle through grit and economic uplift — that the rapper maintained his solidarity with the streets. In an interview with NPR Music last year, he talked about why surviving the explicit reality of South Central made him an urban legend of sorts. "If you check the stats — the murder rates and incarceration rates in the years I was a teenager in L.A. — in my section of the Crenshaw District, in the Rollin 60s, none of my peers survived. None of my peers avoided prison. None of 'em. Everybody got bullet wounds and felonies and strikes. So to make it out mentally stable and not in prison and not on drugs, that's a win. That's a victory in itself. Then to be in the position I find myself in as an artist and entrepreneur who has respect around the world — that's legendary. And I say it in the most humble way," Nipsey Hussle said. "When I reflect on it, it's unbelievable. It's gotta be evidence of a divine presence, because it wasn't that I'm just the smartest dude or just wiggled my way through. It had to be a calling on my life." News of his death sparked an outpouring of messages on social media from such notable peers as Rihanna, Drake, Chance the Rapper, Meek Mill, LeBron James and many others. One message, from L.A. Police Commissioner Steve Soboroff, said that he and LAPD Chief Michel Moore had been scheduled to meet with Nipsey Hussle on what turned out to be the day after his death to discuss curbing gang violence: "We (@LAPDChiefMoore and I ) were meeting , at the request of @NipseyHussle with him and @rocnation tomorrow at 4pm to talk about ways he could help stop gang violence and help us help kids. I'm so very sad." Note: The playlist below includes explicit content.